It is difficult / to get the news from poems / yet men die every day / for lack / of what is found / there. 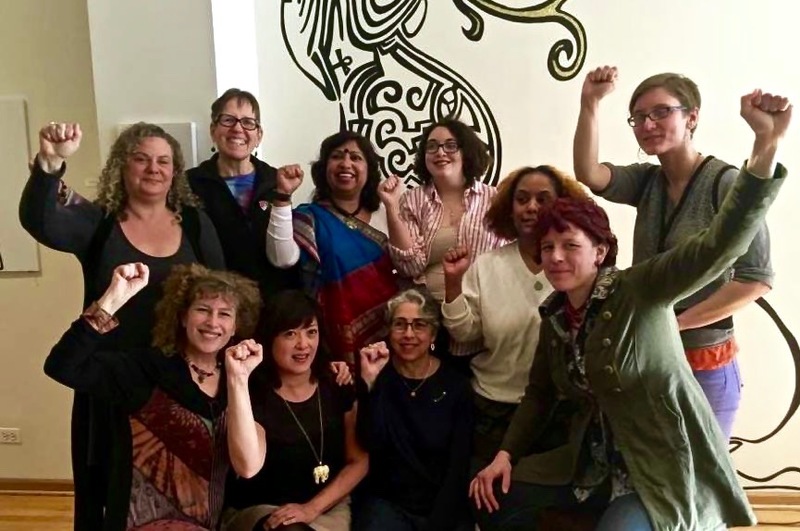 Women Writers Resist! at Woman Made Gallery, Chicago, IL. January 15, 2017. 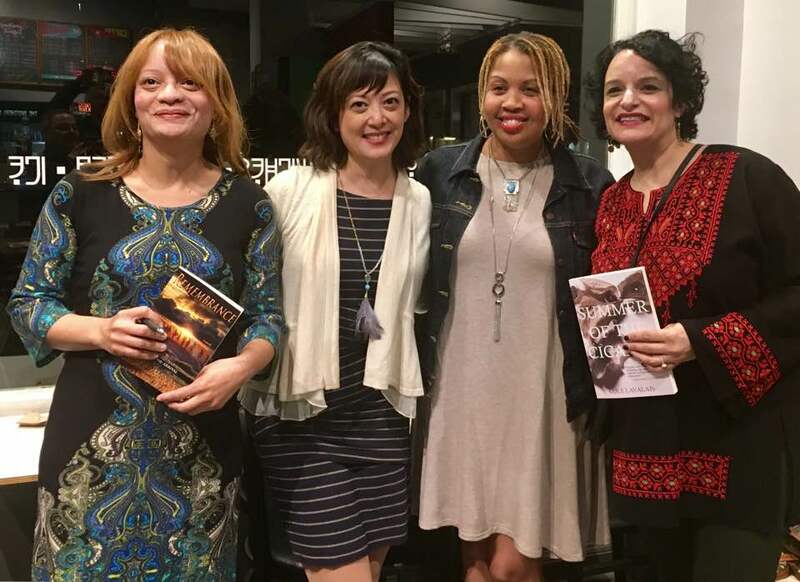 Women of Willow Books (L-R) Heather Buchanan, Angela Narciso Torres, Cole Lavalais, and Sahar Mustafa at RHINO Reads! Nov 2016, Brothers K Coffeehouse, Evanston, IL. Sept. 26, 2015. 100 Live Lyre Reading for 100 Thousand Poets for Change. Sponsored by Glass Lyre Press. Bread Loaf Writers' Conference 2015. Aug 11-22, Middlebury VT. With poet Karin Gottshall. August 9, 2015. 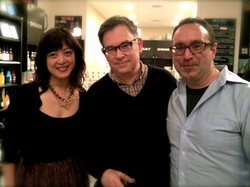 The Baldwin Protocols Reading Series feat. 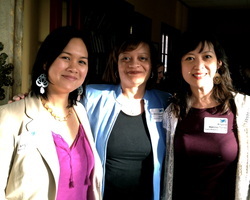 Angela Narciso, Krista Franklin and Angela Davis Fegan. La Maison Negritude, Chicago, IL. August 2015. 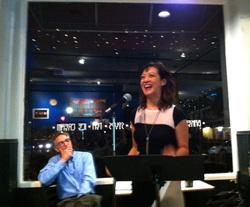 The Baldwin Protocols Reading Series. 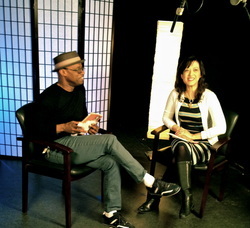 Poets & Writers Live! 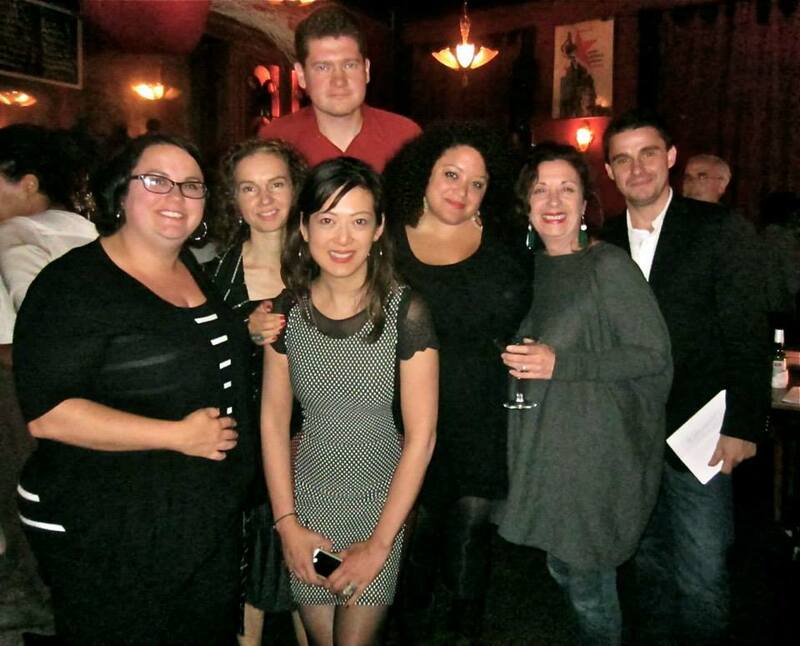 Chicago: Agents and Editors. 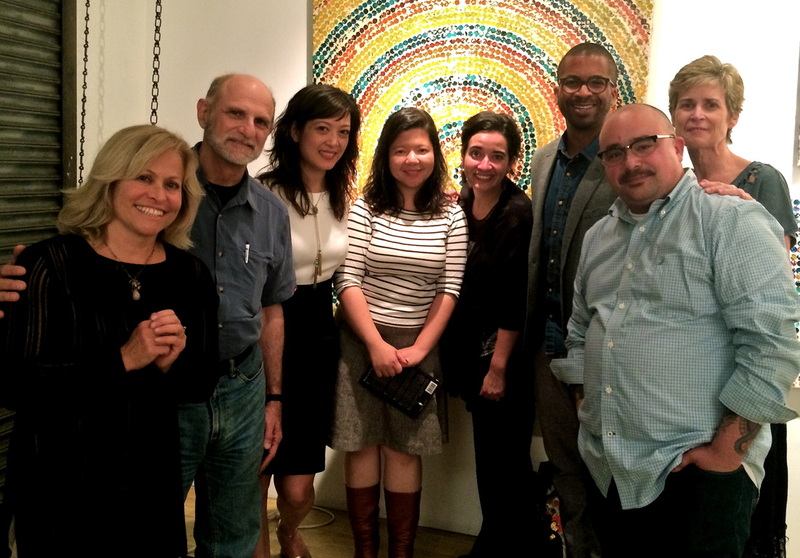 With Bonnie Marcus, Kevin Coval, Kelly Norman Ellis, Haki Madhubuti, and Angela Narciso Torres. 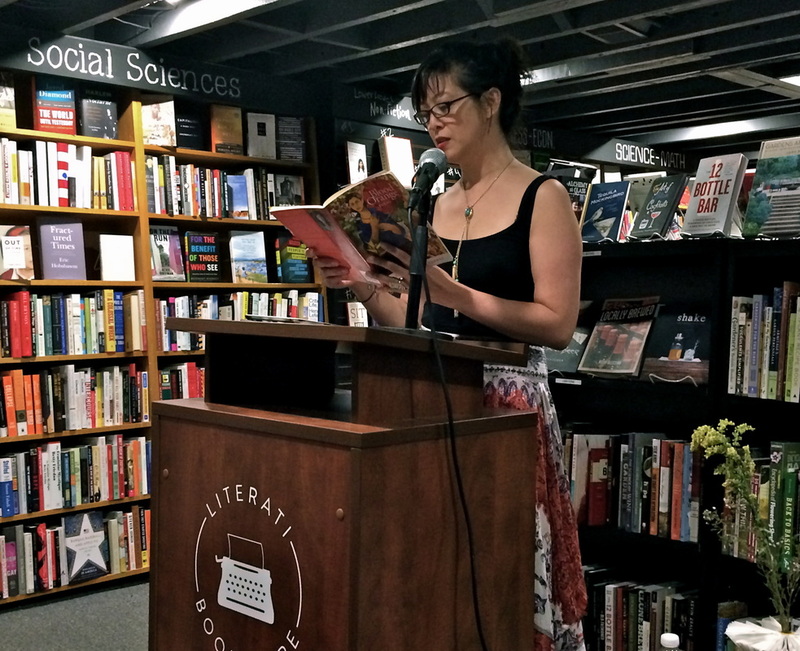 Reading with Suzanne Scanlon at The Mingle Reading series @Ravenswood Used Books, Chicago. May 2015. RHINO 2015 Release Party with co-editors Gail Goepfert, Jacob Saenz and Virginia Bell. April 2015. August 9, 2018. 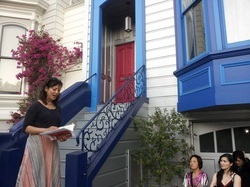 Featured reader at Palabra - an evening of poetry in historic Barrio Logan, San Diego. Big thanks to host Ted Washington and to La Bodega Gallery for the warm welcome. Going into my third year as a reader for New England Review, I want to thank editors Rick Barot and Carolyn Kuebler for including me on NER's editorial panel beginning the Spring 2018 issue. My first assignment was an interview I conducted with contributor Oliver de la Paz, whose poem appears in this issue. Stay tuned--link to follow soon! Huge thanks to Jet Fuel Review for nominating my poem, "Recuerdo a mi madre" for Bettering American Poetry 2017! You can read it along with some other new poems in Jet Fuel Review, Issue 14. A new poem, "What Binds" will be published in Mom Egg Review, Issue 16 this April 2018. Deeply grateful to the Huffington Post for this November 2017 interview! June 10, Sunday 4:30 pm. 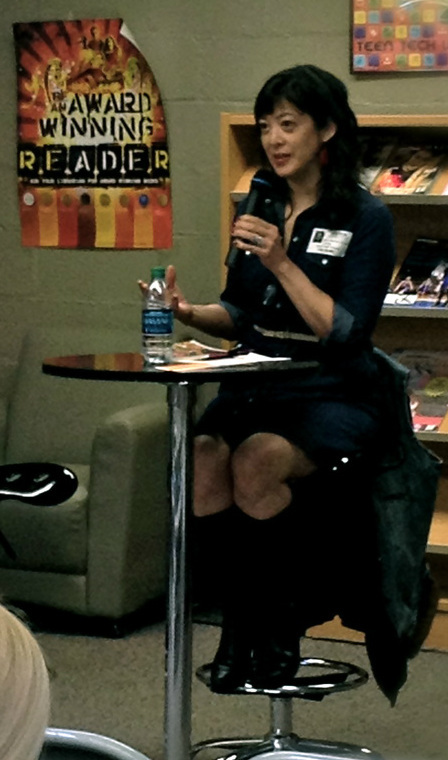 Book Talk/Reading at Women's Museum of California, San Diego, CA. 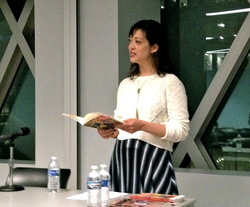 Every month the Women's Museum of California features a woman author who will read from or perform their work and engage in dialogues with audience members. Discussions can center on their latest project, their writing inspiration and process, and challenges of being a woman writer. With the commitment to bring diverse voices and a variety of stories from local and visiting authors, the series will include both published and unpublished works from writers well known, unknown, and all the places in between. This month the Women's Museum of California invites Angela Narciso Torres to speak about her book Blood Orange: Poems, winner of the Willow Books Literature Award for Poetry. The poems in Angela Narciso Torres' book acknowledge the ever-changing nature of home and how, over time, it grows to contain many elements beyond the boundaries of house and body—geographies and objects, oceans and relationships. April 7, Saturday 6:30 p.m. Poetry & Art Series 2018 presents "Cultures Connect" in San Diego, featuring authors Francisco Bustos, Sharon Elise, Angela Narciso Torres, Viet Mai, Alexis Ng, Pilar Rodriguez Aranda, and Ted Washington. April 15 Sunday, 2-4 pm. RHINO 2018 Release Party. Chiaravalle Montessori School, Evanston, IL. 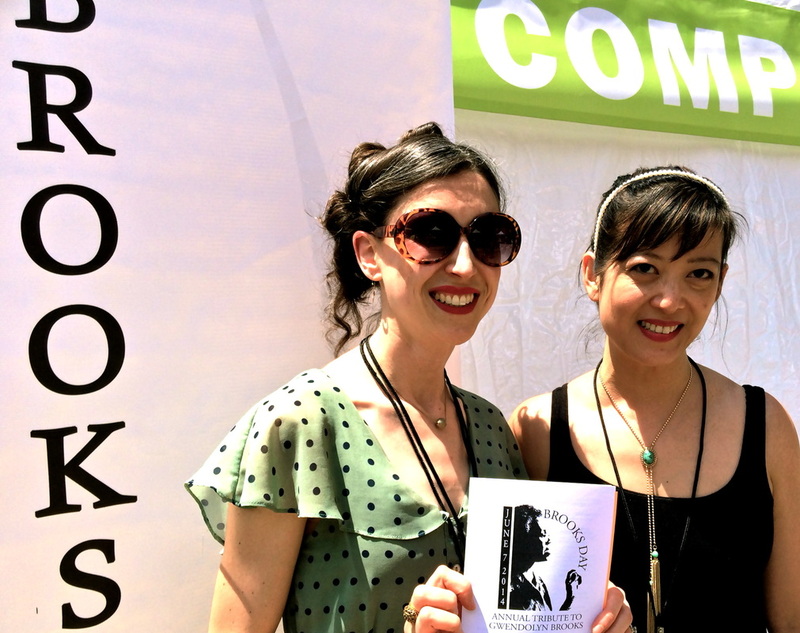 April 21-22 Los Angeles Festival of Books. University of Southern California Campus, Los Angeles, CA. Join RHINO editors, contributors, and friends as we celebrate the launch of RHINO 2018! RHINO editors, journals, and merchandise will be available at our Festival booth (location TBA), as well as a reading by RHINO poets, our first installation of RHINO Reads! West. We will also be launching RHINO Reviews!--an upcoming, much-awaited book review feature on rhinopoetry.org! Details forthcoming. April 21, Saturday, 6:30-8:30 pm RHINO Reads! West! Featured Readers: Cyrus Armajani, Nan Cohen, Patrick Howell, Shadab Zeest Hashmi, Kara Kremer, Chloe Martinez, Kimberly Reyes, Emily Vizzo, and July Westhale. March 17, 2018 Pinay Gathering in Celebration of Women's History Month. Philippine Expressions Bookshop. San Pedro, Ca. 3-6 pm. October 15, 2017 - Woman Made Poets Come to Pilsen. Woman Made Gallery's 20th International Invitational and the first reading in their new Pilsen gallery. Readers: Toni Asante Lightfoot, Marty McConnell, Marilyn Nelson, Angela Narciso Torres, and Lina Ramona Vitkauskas. Curated by Nina Corwin. October 10, 2017 - Reading with Bill Yarrow - Whittier College, Whittier, CA. Hosted by Tony Barnstone. 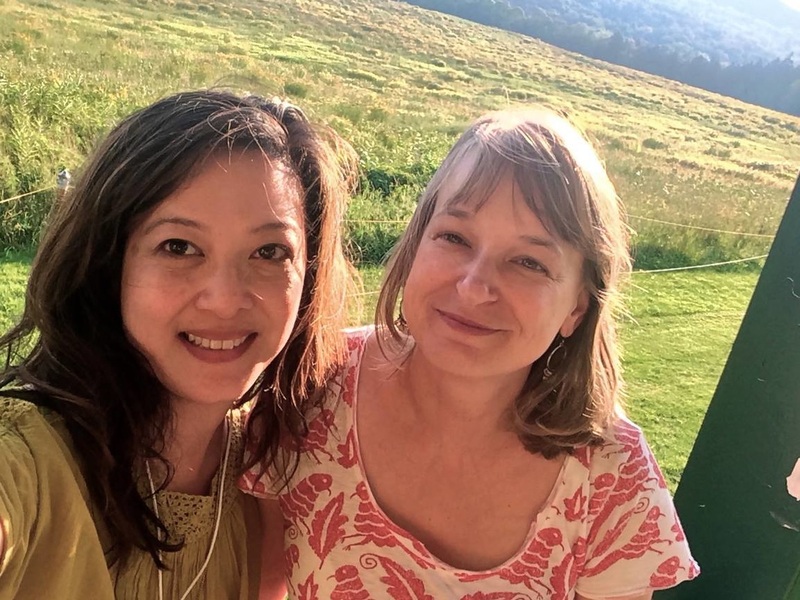 ​ May 18-21, 2017 - Guest Teacher - New England Young Writers Conference at the Bread Loaf Campus, Middlebury, VT.
May 15, 2017. Poets Resist! Reading. Honored to read with this stellar group of poets: Roger Reeves, Tyehimba Jess, Simone Muench, Marilyn Nelson, Nina Corwin, Barbara Barg, Paul Breslin, Michael Gregory Stephens and Michael Nabors at Second Baptist Evanston. April 23, 2017. RHINO 2017 Release Party. Evanston, IL. February 2017 - Poem published in The Golden Shovel Anthology: Poems Honoring Gwendolyn Brooks. Editors Peter Kahn, Ravi Shankar, and Patricia Smith. University of Arkansas Press. Order a copy here. January 15, 2017: Women Writers Resist! at Woman Made Gallery. Chicago, IL. As part of #writersresist, our first reading of 2017, themed "Inauguration: Affirmation, Empowerment & Resistance" featured vocalist Ugochi Nwaogwugwu, along with poets Susanna Lang, Dipika Mukherjee, Kee Stein, Kimberly Marie Ousley, Dina Elenbogen, and Freesia McKee. In addition, activist Dr Patricia O'Brien, on faculty at UIC school of social work, spoke on Resistance and Radical hope. 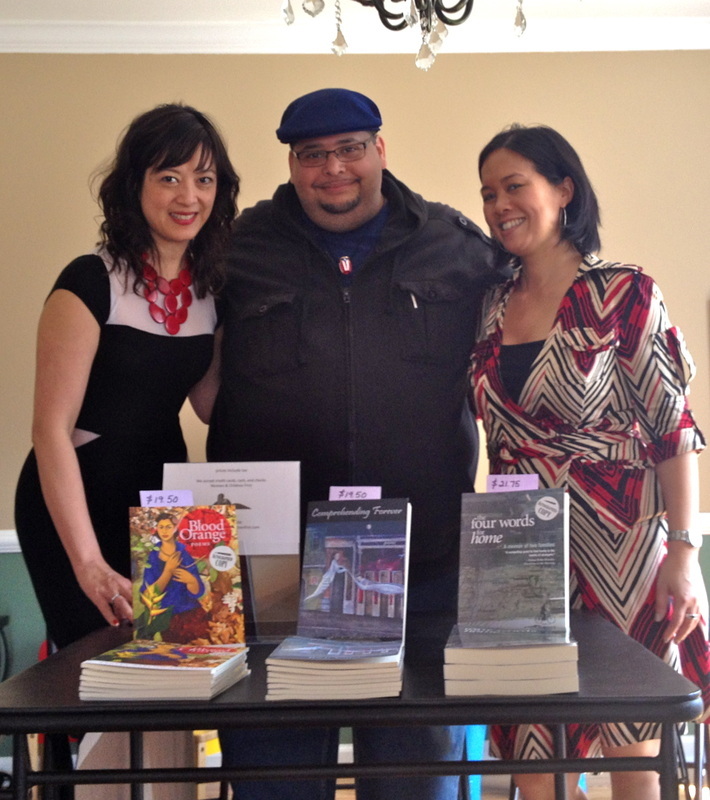 Reading with Willow Books Authors Heather Buchanan, Sahar Mustafa and Cole Lavalais. Event details here. November 18, 2016. Women of Willow Reading at RHINO Reads! Brothers K Coffeehouse, Evanston, IL. Feeling blessed to have read with these phenomenal Women of Willow at RHINO Reads!, and to be part of this rich tapestry of voices. Deepest thanks to my Willow Books sisters--Heather Buchanan, Cole Lavalais, and Sahar Mustafa for your words, music, and presence tonight. Delighted to return this year as a featured reader for Lake Forest College's Tusitala Teller of Tales Festival (Nov 14-16) along with amazing poets Parneshia Jones and Ladan Osman. Thanks to Nell Whalen and the entire LFC Tusitala crew for the kind invitation, and to artist Miwa Lee for the lovely posters. Honored to be one of the Chicago-based poets featured at the Carl Sandburg Literary Awards on October 26! This annual event, which benefited Chicago Public Library and the Chicago Public Library Foundation, will honor Chicago literary greats Erik Larson, Scott Turow, and Amina Gautier. Watch the video of my fifteen seconds of fame here! AUGUST 15, 2016. Check out my review of Rochelle Hurt's The Rusted City at Blue Fifth Review! New England Young Writers' Conference 2016. Middlebury College, VT.
May 7, 6:30-8 pm Reader, Evanston Lit Fest. Readings from RHINO 2016 poets Pam Miller, Max Barry, Jim Warner, and Ann Hudson, as well as RHINO editors Ralph Hamilton, Kenyatta Rogers, Jacob Saenz, and Angela Narciso Torres. April 30. Independent Book store day at The Book Stall at Chestnut Court. Reading and Rhino Writes! Poems-to-Go! April 17, Sunday. RHINO 2016 Release Party and 40th Anniversary Celebration! 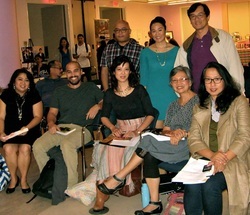 Kuwentuhan (Talkstory) is a collaborative project between The Poetry Center and Barbara Jane Reyes, which involves a 3-day artist residency in San Francisco, taking place the full days of Thursday through Saturday, April 21–23, 2016. Guest artists: Arlene Biala, Jennifer Foerster, Javier Juerta, Urayoán Noel, Aimée Suzara, Lehua Taitano, and Angela Narciso Torres. Panel: Creating Opportunities for Writers of Color: A Continued Urgency. February 7, Sunday. Law and Disorder: A Poetry Reading. 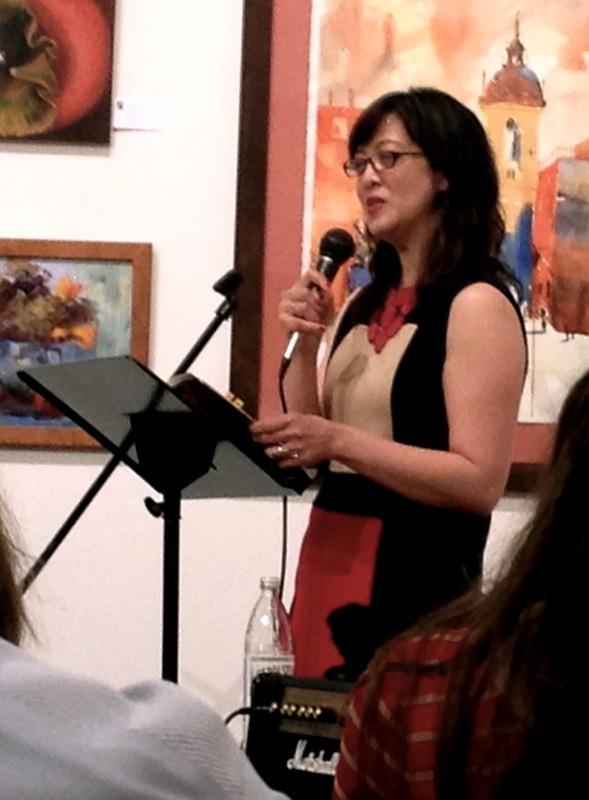 Woman Made Gallery Literary Events. Featuring Krista Franklin, Patricia McMillen, Anne Woodsworth, Jenene Ravesloot, and a poetry+movement collaboration from Jennifer Karmin and J'Sun Howard. January 9 - Northwest Cultural Council Second Saturday Worskhop - Guest Workshop Leader. Topic: Poetry of Place, Exile and the Self. 4 - 5:30 RHINO Poetry will stage a reading showcasing RHINO poets and editors Ladan Osman, Pablo Otavalo, Chris Green, Katie Hartsock, Jacob Saenz, Angela Narciso Torres, Joe Eldridge, Keith Wilson, Donna Vorreyer, Valerie Wallace, Kenyatta Rogers, and Rachel Jamison Webster!!! 11 am- 5 pm Come visit RHINO Poetry's book fair table at the Expo. Copies of RHINO 2015, back copies, and RHINO swag will be available! September 26 - 100 Thousand Poets for Change. Featured Readers: ANGELA NARCISO TORRES, MARC FRAZIER, LOIS P. JONES, SANDRA MARCHETTI, RALPH HAMILTON, JOAN COLBY, HELEN DEGEN COHEN, RUTH GORING, and BILL YARROW. August 9, 2015. The Baldwin Protocols @Le Maison Negritude. August 11-22, 2015. Bread Loaf Writers' Conference Stanley P. Young Fellowship in Poetry and workshop assistant to Terrance Hayes. Featuring RHINO 2015 poets Heather Cox, John McCarthy, Ruth Goring, Lisa Croneberg; RHINO editors Virginia Bell, Helen Degen Cohen, and Angela Narciso Torres and RHINO 2010 poet Dina Elenbogen. Creative Coworking, 922 Davis St. Evanston, IL. The Guild Complex continues a new reading platform to foreground Asian / American authors and themes. Curated by Dipika Mukherjee, this spring’s program—The Alphabet of Distant Harbours—features Toni Nealie, Angela Narciso Torres, and Nicholas Wong. Join RHINO editors as we unveil RHINO 2015. Featuring readings by contributors to this beautiful new issue, and an Open Mic for past contributors. 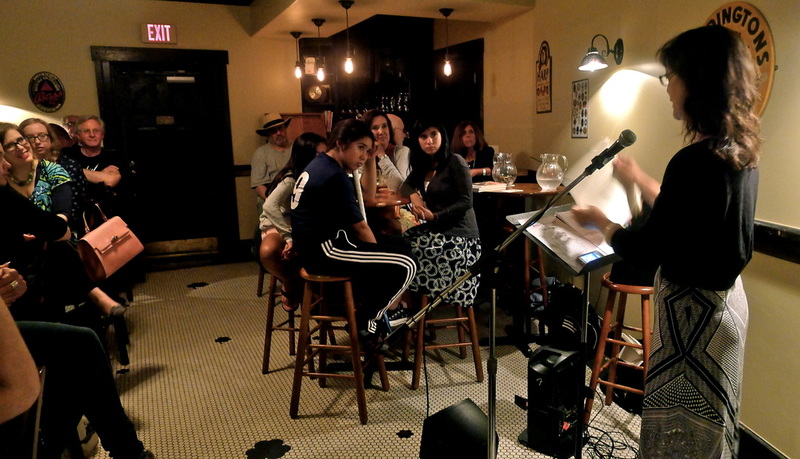 Eat, drink, and be poetry! I wrote an article for the Spoon River Poetry Review blog. Check it out here! From borders between nations to the borders constructed between family members, Chicago-based poets Virginia Bell, Sarah Carson, Heather Cox, Angela Narciso Torres, and Ladan Osman will read work that crosses borders both literally and figuratively in this reading presented by City Lit Books. 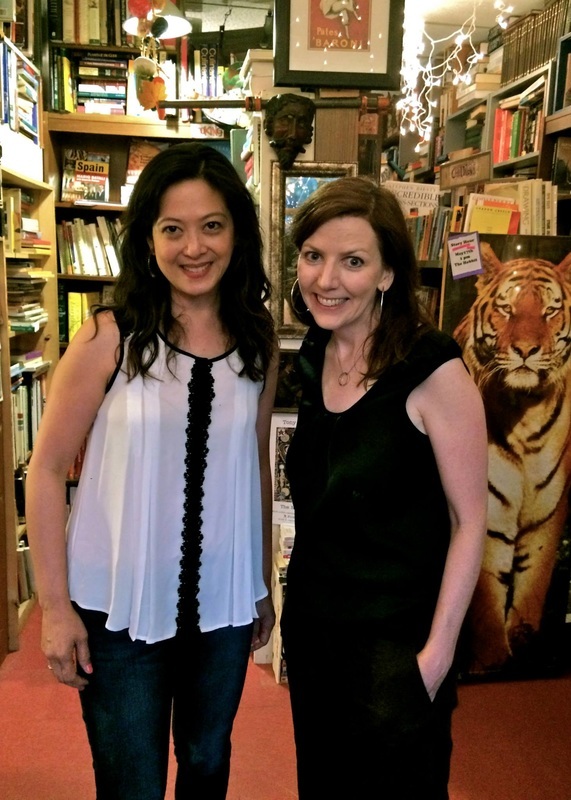 August 22 - Interviewed by Jee Yoon Lee at the Writing Like an Asian blog. Raffles Hotel, Makati, 5-7 pm. Hosted by Krip Yuson. 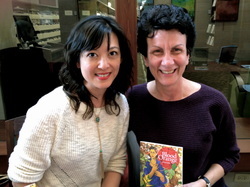 With Angie Chuang and Heather Buchanan of Willow Books. I'll be teaching a workshop on Poetry of Place. Room 2B, Washington State Convention Center, Level 2. Room 302, Level 3, Western New England MFA Annex, at the Seattle Convention Center. The 'Annex' is another name for The Conference Center (TCC). West Haven, CT - February 13, 2014, Thurs 6:30 pm - CANCELLED due to extreme weather in the Northeast. Stay tuned for alternate date (April 2014). 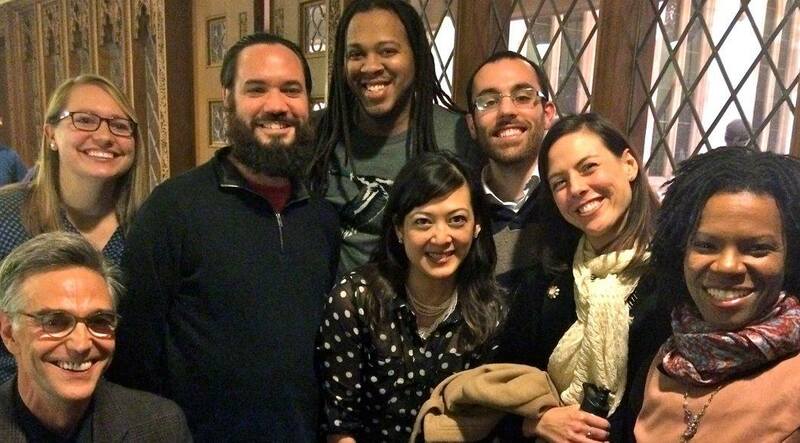 With fellow artists-in-residence at the first 2014 winter residency at Ragdale Foundation. 1260 Green Bay Road, Lake Forest, IL. January 12, 2014. Blood Orange is now on its second printing! The book is temporarily out of stock on Amazon.com but is still available through Small Press Distribution and Aquarius Press. 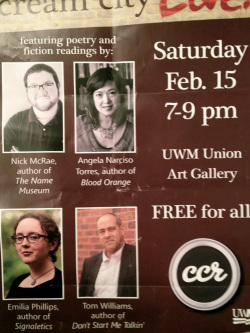 Better yet, come to one of the upcoming readings, say hello, and get a signed copy! The Guild Complex and Coffeehouse Press co-sponsor a reading to benefit Typhoon Haiyan victims. Pulished in the Ann Arbor Journal on Nov. 25, 2013. 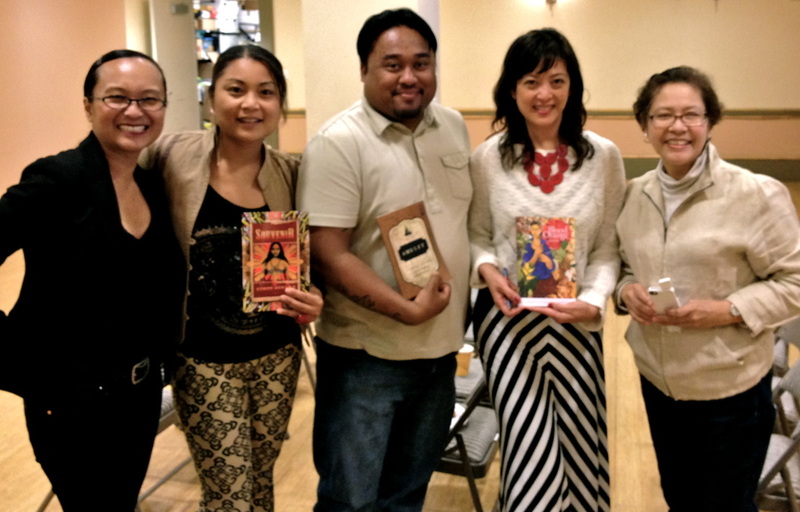 With Barbara Jane Reyes, Amy K. Bell, Paul Ocampo and Yael Villafranca. Hosted by Melissa Rae Sipin-Gabon. With Jon Pineda, Lysley Tenorio, Dawn Mabalon, Helen Dizon, Luisa A. Igloria, Evelyn Ibatan Rodriguez. With Randall Horton, editor of Aquarius Press, Lita Hooper (Willow Books author of Thunder in Her Voice), Heather Buchanan, owner and publisher of Willow Books, and Derrick Harriell, Willow author of just-released Ropes. Willow Writers on Tour at Jungle Juice Bar **See more photos of Willow Writers on Tour. Blood Orange BOOK LAUNCH at Rhino Reads! **See more photos from the launch here. Narciso Torres, right, with artist Herme Alegre. DETROIT, MI / (September 6, 2013) — Willow Books author Angela Narciso Torres, Poetry Grand Prize Winner of the 2013 Willow Books Literature Awards, will be releasing her prize-winning collection on September 30. The richly detailed cover of the book is the result of a collaboration between Narciso Torres and Filipino artist Hermes Alegre, who was unveiling a brand new painting, “Catalina,” at the Saturday Group of Artists Exhibit, Shangri-La Plaza, EDSA, Manila, Philippines. The next installment of his Aura series, Alegre’s painting immediately caught the eye of Narciso Torres, who happened to be visiting her ancestral home this past summer and heard about Alegre’s exhibition. A graduate of Warren Wilson MFA Program for Writers and the Harvard Graduate School of Education, Narciso Torres has received fellowships from the Illinois Arts Council, Ragdale Foundation, and Midwest Writing Center. Born in Brooklyn and raised in Manila, she currently resides in Chicago, where she teaches poetry workshops and serves as a senior poetry editor for RHINO. The Willow Books Literature Awards recognize literary excellence in prose and poetry by writers from culturally diverse backgrounds. 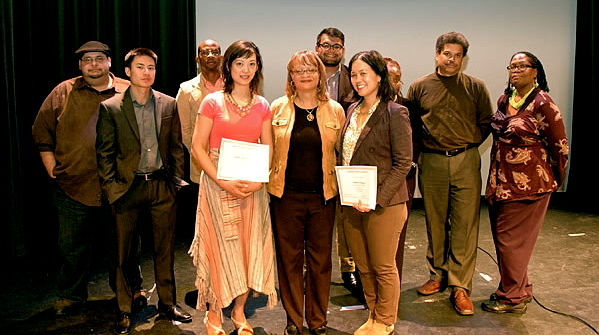 The Grand Prize winners were selected from a field of ten finalists. The prose winner is Angie Chuang. Willow Books, the literary imprint of Aquarius Press, specializes in exceptional literature by writers dedicated to the craft. Its mission is to develop, publish and promote writers typically underrepresented in the literary marketplace. For more information on the awards, contact redoliveconsulting@gmail.com. 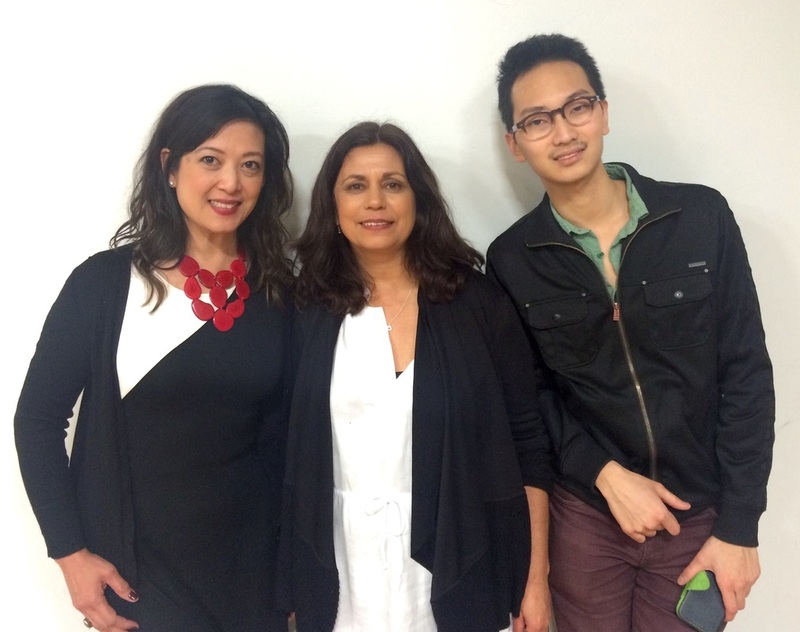 April 6, 2013 - Angela Narciso Torres wins Willow Books Literature Award grand prize for poetry. 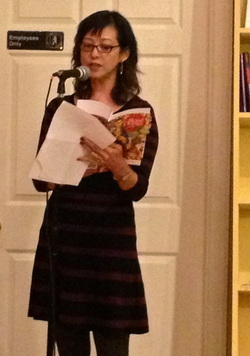 Click for a video of Angela reading her work at the 2013 Willow Books Lit Fest Finalist reading. 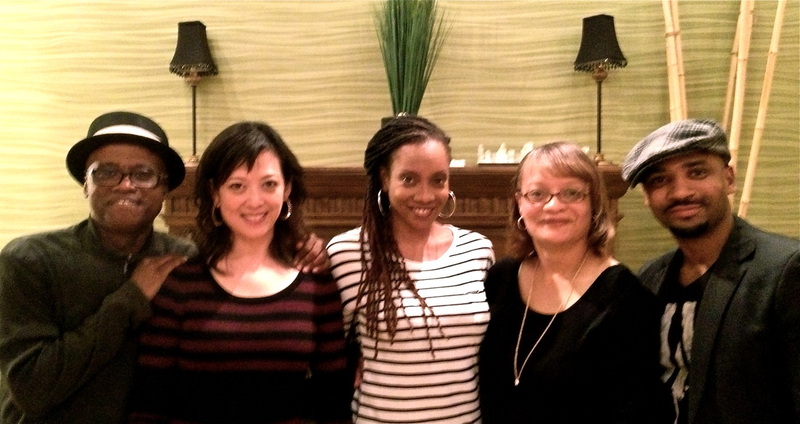 At the Willow Books Literature Awards Ceremony with Heather Buchanan of Willow Books, Angie Chuang, Fiction Prize winner, and finalists.